It’s important to start training your new puppy early before bad habits or unwanted behaviors can develop. The ideal age to start training and socializing your new puppy is between 50 to 90 days old. Puppies that come in at this age are a clean slate eager to learn and are easier to train. Lack of proper training and socialization at a young age is a one of the main reasons dogs can develop problem behaviors that can lead to abandonment in shelters later in life. At Kathy’s Dog Daycare & Training, we specialize in training puppies through structured classes that repeat over a long period of time. We can safely socialize your puppy with other dogs, get them use to being handled by vets / groomers, teach them basic commands, and instruct the owners so that they can continue the training and reinforce the proper behaviors. The end result is a confident and happy dog that can better interact with their owners and the world around them. 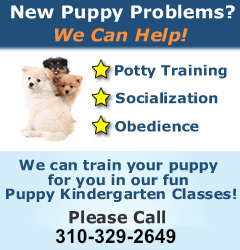 We can train your puppy at our location during the day! The keys to our training system are offering structure (we do the same thing at the same time of day), and repetition with positive rewards over weeks and months of classes/sessions. The proper behaviors become habits that the dog enjoys doing over time. Getting a new puppy or rescue soon? We can create a training program to meet your specific needs. We offer classes that span 24, 36, 48 or 60 full day sessions depending on the breed, age, and types of existing problem behaviors. Please call us at 310-909-4536 or visit us for a complimentary initial consultation. « How your Puppy can learn to LOVE Teeth Brushing!